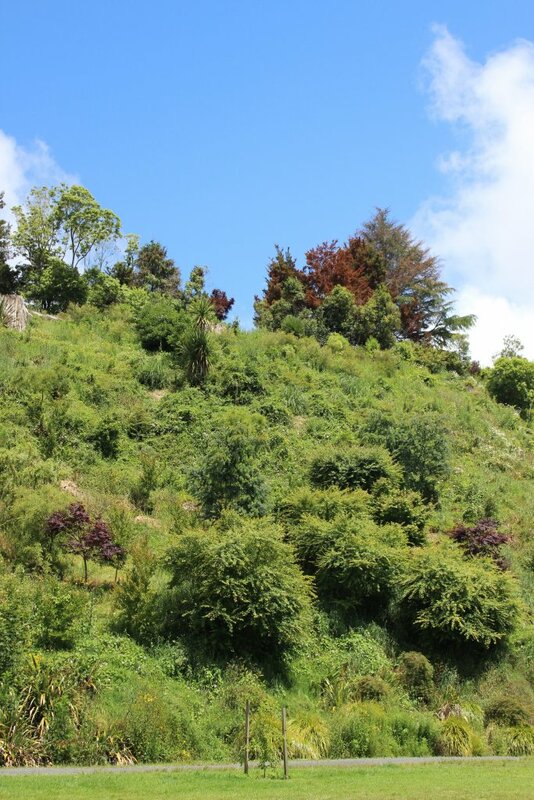 The dead and dying trees on the skyline overlooking Lake Te Kō Utu were planted more than 20 years ago by the Cambridge Tree Trust, and have fallen victim to poisoning, with drill holes found in their trunks. Waipā mayor Jim Mylchreest and Cambridge Tree Trust chair Don Willoughby are devastated by the poisoning of five established trees on the southern side of Cambridge’s Lake Te Kō Utu. The trees, including three native totara, a cryptomeria and a cedar, are in poor condition after being discovered last week with drill holes indicating poisoning. The trees are going brown and losing their leaves. The chair of the Cambridge Tree Trust, Don Willoughby, said the trees had been planted more than 20 years ago and the act of vandalism was “rather distressing”. Don has his own strong opinions about who might be responsible and hopes the perpetrators will be brought to justice. It was the largest poisoning of trees planted by the trust in the 20 years Don has been involved, he added. Mayor Jim Mylchreest has slammed the vandalism calling it an “attack” on the town of trees, and council staff have handed the matter over to the police. The damaged trees were discovered by members of the Cambridge Community Board, Cambridge Tree Trust and Lakewood Development who were on site to discuss future improvements to the area. Council’s arborist is monitoring the trees’ condition, but they are not expected to recover and will eventually need to be removed, Mayor Mylchreest said. He said the trees will be replaced with similar specimens and a close eye will be kept on that area. Mayor Mylchreest asks that anyone who has any information about the damage to contact the police. The mayor would not be drawn on who might be involved in the poisoning but hoped they would be caught.